I can’t tell you what a nice birthday month I’m having. I’ve had cake everyday for about two weeks and sadly now it’s all gone! What the heck am I going to have for breakfast tomorrow?! I had to share the handmade gift I received from Andrew with you. 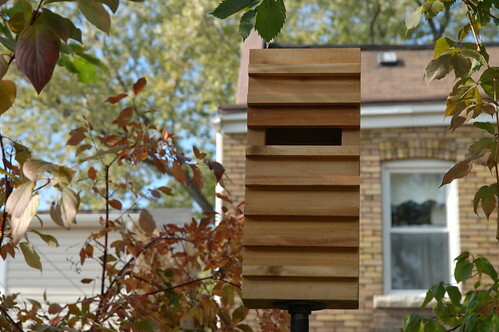 A beautiful cedar birdhouse of his own design. Even better, he used all scraps of cedar wood he had lying around the house from past projects. That’s the kind of design I love! I’ve always wanted a birdhouse and this one is deluxe. I can’t wait for a happy bird or bird family to move in! This is such a thoughtful and beautiful gift! It’s beautiful. 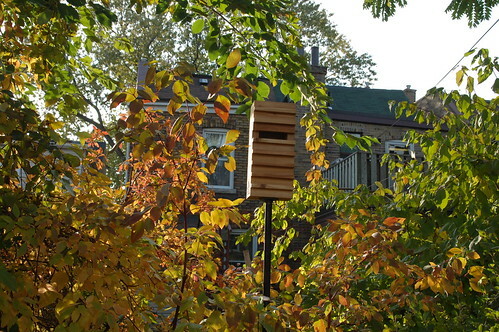 Does Toronto have birds that will move in over the winter or will you have to wait until the spring for your feathered family? thats such a fantastic gift!!!! Also, cake everyday for two weeks? Sign me up! I’ve made a few birdhouses in my time. Problem was always that I couldn’t get the birds to have as much appreciation for my birdhouses as I did. No Birds. On the other hand how could any bird refuse a free room in such a beautiful bird house as this. And, it must smell really great inside. I’m forwarding your website to my daughter who is extremely crafty. I know she will appreciate you content. All the best. That is super! Lucky you. Not only is it incredibly stylish, but what a beautiful gift! So sweet that he made it himself. I hope some lovely friends find a home there. that is so darn pretty! How incredibly sweet. I really love the design but my favorite detail is the heart and the letter A on the side. Really lovely and thoughtful. 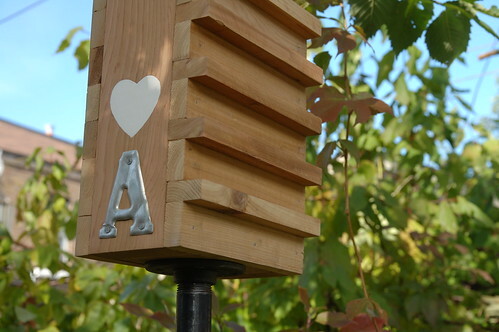 Andrew is a real sweetheart and super talented in the construction of bird houses.